There have recently been many tributes to the Cure‘s 1989 classic “Disintegration” as it turns 25 years old. This is a great LP, in my opinion there are better Cure LPs, but this is the one that broke America, so here’s a review from Billboard. No need to check the almanac to see what the weather was like on May 2, 1989, the day the Cure released its eighth studio album. Once copies of “Disintegration” started hitting CD trays and turntables, the skies turned grey and the rain began to fall, and sad boys and girls everywhere soaked it all up like sponges. Such is the power of these dozen songs — slow, dark, sensual ruminations on losing love and feeling washed up. Oddly enough, when Cure mastermind Robert Smith began work on “Disintegration,” he was a recently married 29-year-old whose pioneering U.K. post-punk band was finally making headway in America. The group’s previous album, 1987’s “Kiss Me, Kiss Me, Kiss Me,” had reached a respectable no. 35 on the Billboard 200, and after more than a decade in action, they seemed poised for breakout success. Still, Smith was completely freaked by the prospect of turning 30, and amid tensions with his bandmates, he worried he’d missed his chance to make a masterpiece. Such was his motivation for going off and writing much of “Disintegration” on his own. He emerged with a set of droning slow-burns inspired by the overall cruddiness of his situation, and not surprisingly, his label wasn’t pleased. Indeed, “Disintegration” had “commercial suicide” written all over it, but it proved gloomy in all the right ways, climbing to no. 12 on the Billboard 200 -— the Cure’s highest chart placement to that point. The follow-up, 1992’s “Wish,” reached even higher, peaking at no. 2, but “Disintegration” remains the Cure’s best-selling LP, as well as the one people still talk about. It’s made countless all-time best-of lists, and 25 years later, it sounds like nothing in the band’s discography -— or in anyone else’s. Keep reading for our track-by-track take on this melancholy stunner. “Plainsong”: After about 20 seconds of wind chimes, the bass, synths and drums hit like a thunderclap, and just like that, you’re in Smith’s stormy little world. When he finally gets around to singing, he quotes a girl who compares the weather to death and complains about feeling old. Smith should have handed her the pen and let her write the rest of the record. “Pictures of You”: If not for the nearly two-minute intro and 7:49 overall run length, this would have been a smash. That being said, it’s hard to imagine “Pictures of You” being any shorter. Smith is working his way through a big old stack of photos and an even bigger pile of emotions, and as he lingers on each image, he savors the sweet, sweet sadness. He claims to want this girl back, but given the way those guitars tangle and glisten, it’s possible he prefers the pining. “Closedown”: For a guy who’s “running out of time,” Smith is in no rush to introduce the main synth riff or step up to the mic and start singing. Then, this one’s all about stewing, and with no real structure to speak of, it’s like an intro that builds and builds until there’s no need for verses or choruses. “Lovesong”: Simple and concise, this hit No. 2 on the Hot 100, the Cure’s biggest U.S. single to date. It’s among the most maudlin expressions of head-over-heels love you’ll ever hear. Smith sings the verses in the present tense, meaning he’s still with this girl who makes him feel “young” and “fun” and best of all “home again.” He should be happy, but as we know, happy ain’t his style. “Last Dance”: Smith and his beloved are in the winter of their relationship, and after years together, the good times aren’t so good anymore. Even Christmas is “flatter and colder” than it used to be. Appropriately, a chill runs through the music, as those shimmering guitars heard on previous cuts turn suddenly shrill. The ending Smith envisions here might be worse than a breakup. “Lullaby”: Proving once again how different America and Britain are, this creepy-crawly fairy tale reached no. 5 in the U.K., where it remains the Cure’s highest-charting single. Here in the States, it managed only no. 74, which isn’t bad, considering it plays like a Tim Burton movie condensed into four minutes of eerie pop hypnosis. No one needs to hear this while driving a car. “Fascination Street”: Thanks to that surging bassline and whoosh of psychedelic guitar noise, Smith has the wind at his back as he cruises the titular thoroughfare, looking for his version of a good time. “Pull on your pout and lets move to the beat,” he sings, inventing a goth dance craze that unfortunately never caught on. “Prayers for Rain”: Another formless tune outfitted with a great hook — this time played on the guitar — “Prayers for Rain” may be the disc’s most over-the-top melodramatic moment. That’s kind of like saying it’s the wettest raindrop. “The Same Deep Water As You”: On an album lousy with epics, this has the distinction of being “the long one.” Over the course of 9:19, there’s not a whole lot of movement or variation, nor should there be, given that it’s a song about sinking deeper and deeper into love affair that may have already ended, and that is definitely swallowing Smith whole. “Disintegration”: The eight-minute title track leaves Smith with plenty of time to pack in lyrics, and that’s just what he does. Whereas the other songs are spare and opaque, this one is fairly direct and overflowing with words. When Smith sings “songs about happiness murmured in dreams,” you’d swear he’s reviewing his own album. “Untitled”: The album ends with a tune so depressing that Smith couldn’t even give it a name. As always, though, the guitars chime gorgeously, and the lyrics reveal Smith to be a livelier, less despondent guy than he’d have us believe. He could have titled this “Hopefully Fighting the Devil” or “Gnawing My Heart Away Hungrily,” two of the great phrases you’ll miss if you close your eyes and get lost in the musical sweep. That’s the only trouble with “Disintegration”: In this enchanted forest, you can’t stop and appreciate every tree. 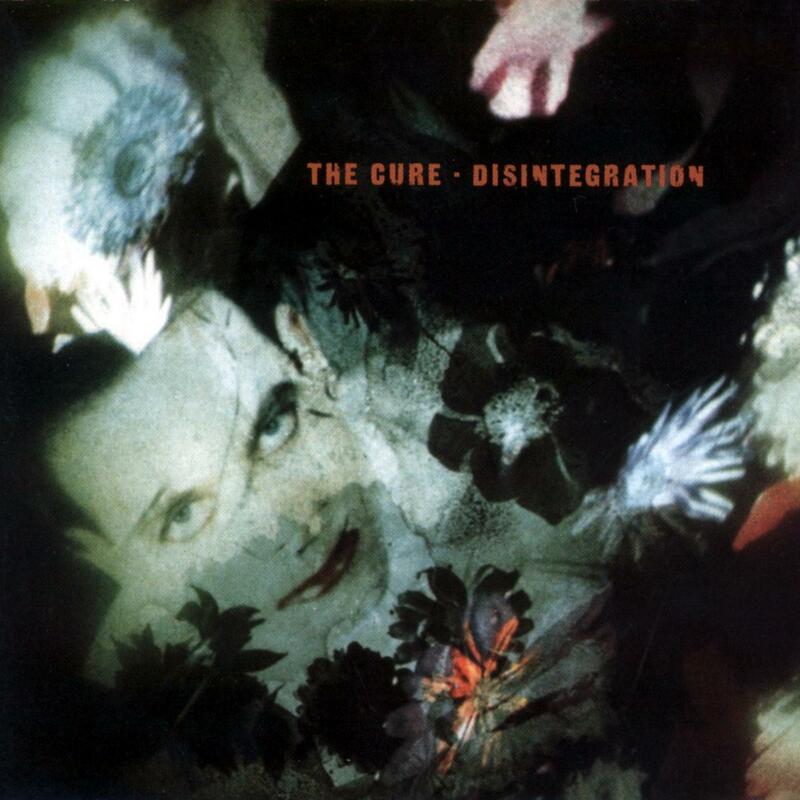 via The Cure’s ‘Disintegration’ at 25: Classic Track-by-Track Album Review | Billboard.